Librarian and fellow of the Royal Society of London, scientific writer, and fellow of the Antiquarian Society of London; born in 1717; died in 1791. He was a son of Abraham Mendez da Costa, who had come from Normandy to reside in England about 1696, and in 1702 had married Esther da Costa, his first cousin. Emanuel Mendez da Costa was distinguished as a botanist, naturalist, philosopher, and collector of anecdotes of literati and of valuable notes and MSS. He was made a member of the Aurelian Society Feb. 7, 1739, and in 1746 was elected a member of the Gentleman's Society at Spalding, and maintained a regular correspondence with Dr. Green, the secretary of that organization. On Nov. 26, 1747, Da Costa was elected fellow of the Royal Society of London, and later its librarian, after which he was elected a member of the Botanic Society in Florence. His publications were: "A Natural History of Fossils" (at the time of its publication the author was esteemed the greatest master of the subject in England); "Elements of Conchology, or An Introduction to the Knowledge of Shells," 1776; and "British Conchology," 1778. 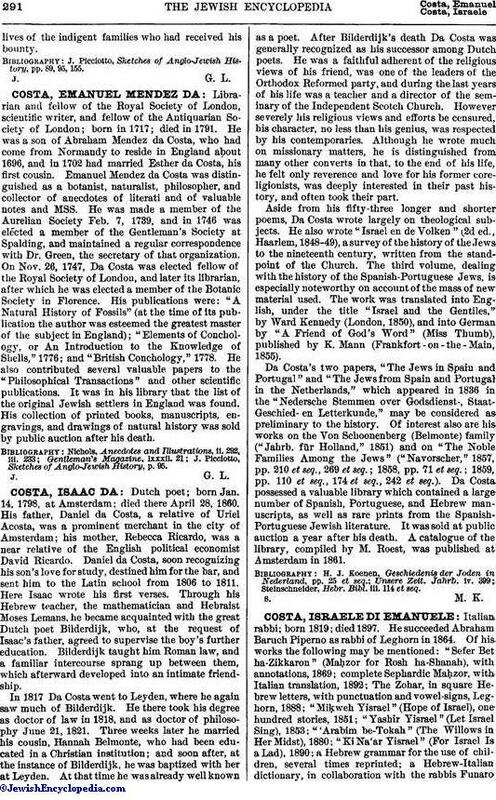 He also contributed several valuable papers to the "Philosophical Transactions" and other scientific publications. It was in his library that the list of the original Jewish settlers in England was found. His collection of printed books, manuscripts, engravings, and drawings of natural history was sold by public auction after his death. J. Picciotto, Sketches of Anglo-Jewish History, p. 95.